The winners (see sidebar) are Alanna Burwell, in the NTP Molecular Pathogenesis Group, headed by Darlene Dixon, D.V.M., Ph.D.; Carri Murphy, in the Chromosome Stability Group, headed by Michael Resnick, Ph.D.; and Porscha Walton, in the National Toxicology Program (NTP) Office of Health Assessment and Translation, led by Kris Thayer, Ph.D. 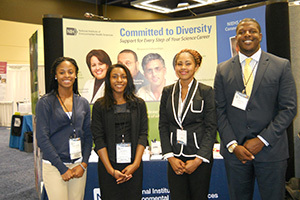 The awards enabled the three participants in the NIEHS Scholars Connect Program (NSCP) to travel to the ABRCMS, Nov. 11-14 in Seattle. ABRCMS bills itself as the largest professional conference for underrepresented minority students, military veterans, and persons with disabilities. As participants in NSCP, Murphy and the other two winners will be able to put the conference experience to practical use. 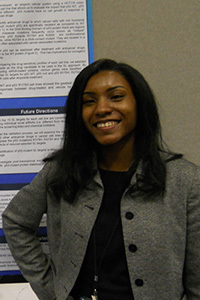 “Scholars Connect gives the scholars a chance to meet with top leadership at NIEHS, have guidance in career development, and three opportunities to present throughout the year,” said Erica Rogers, Ph.D., who coordinates the program for the NIEHS Office of Science Education and Diversity (OSED). “We started in 2012 and are extremely pleased that three of our six scholars this year received travel awards,” added Ericka Reid, Ph.D., director of OSED. Rogers and Reid staffed an NIEHS booth at the conference. NSCP opens the door for undergraduate students interested in a career in science, technology, engineering, or mathematics (STEM) disciplines. Juniors and seniors from academic institutions in the local area spend three semesters on a single research project, under the guidance of a lead scientist, as well as a postdoctoral fellow or staff scientist mentor. The NSCP lasts an entire year, providing opportunities for the scholars to contribute in a meaningful way to the research in their laboratories. “I have been impressed with the seriousness of the [students in the] NSCP,” said Resnick. Resnick’s high opinion of the program was shared by Dixon. “This program is a good opportunity for our staff to interact with, and mentor, students interested in biomedical careers,” she said. 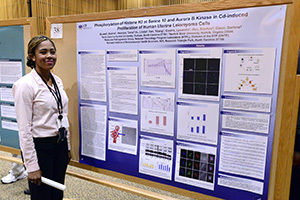 Alanna Burwell, a senior at North Carolina Central University (NCCU), is studying the basic mechanisms of tumor growth in uterine fibroid cells, induced by a low and environmentally relevant dose of cadmium. Burwell works under the direction of Yitang Yan, Ph.D., and Linda Yu. Carri Murphy, is also a senior at NCCU. She is conducting research on the p53 tumor suppressor gene, under the guidance of mentor Daniel Menendez, Ph.D. Her research helped establish a new role for p53 in inflammation and immunity. 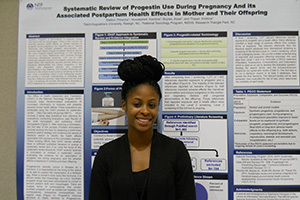 Porscha Walton, a senior at St. Augustine’s University, is identifying various uses of synthetic progesterone drugs and categorizing adverse outcomes, specifically as a result of exposure during development. She is mentored by Kembra Howdeshell, Ph.D., and Abee Boyles, Ph.D.